I’ve written a book. Something tells me you won’t be surprised when I tell you it’s about Steve Jobs and Apple. But this book is different. Really. That’s because (a) I had a unique vantage point to some pivotal events in Apple history, and (b) this book focuses on one thing alone — the core value that has driven Apple since the beginning. 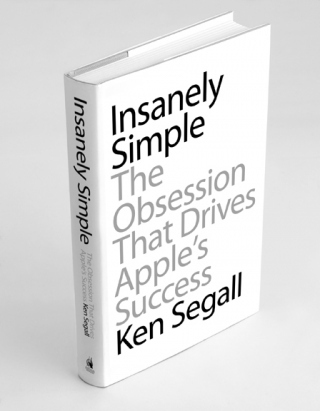 Insanely Simple is about Apple’s obsession with Simplicity. You can see Simplicity in everything Apple does: the way it organizes, innovates and communicates. In fact, one could argue that it was Steve’s unrelenting passion for Simplicity that helped Apple rise from near-death in 1997 to become the most valuable company on Earth in 2011. [...] To Steve Jobs, Simplicity was a religion. But it was also a weapon — one that he used to humble competitors once thought to be invincible. Apple’s devotion to Simplicity is the one constant that can be traced from the first Apple II computer all the way to today’s iPad. Though the company’s success is built upon engineering and design skills, it’s the love of Simplicity that truly powers Apple, revolution after revolution.